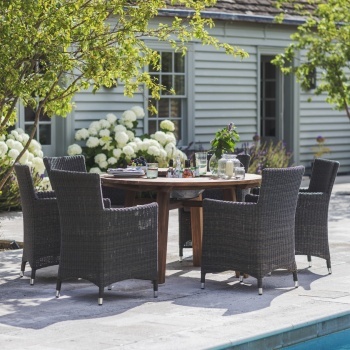 Ensure family and guests are suitably refreshed during summer dinner parties with the St Mawes Round Table Set. Comprising a Reclaimed Teak Table and four Chilgrove Chairs, the set will fit perfectly in a courtyard, decking area or patio. From the popularity of our St Mawes range, we felt adding a circular table is perfect for smaller gatherings or family brunches. Designed with an integral Galvanised Metal trough, it can be filled with ice to keep drinks chilled perfectly and save constant trips to the fridge.